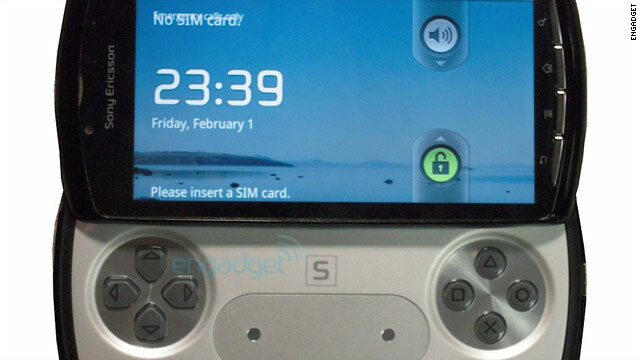 The technology blog Engadget has posted photos of a PlayStation phone -- strong evidence of its existence. San Francisco, California (CNN) -- Stopping short of directly addressing intensifying speculation about a PlayStation phone, Sony's Peter Dille acknowledged that its portable game system could be due for a change soon. Dille, the senior vice president of marketing at Sony Computer Entertainment of America, was asked about the so-called PlayStation Phone, which was first reported by Engadget, in a fireside chat Wednesday at a conference in San Francisco. Refusing to confirm or deny rumors, Dille did say the lack of a cellular data connection could be holding back Sony's PlayStation Portable game system. "The PSP is a Wi-Fi device," he said. "People are used to having always-connected devices." Sony's home game consoles have had life spans of 10 years each, and the PlayStation 3 will continue to be supported for at least that long, Dille said. But "the portable market moves so fast," he said. At six years, the PSP may be looking dry. Indeed, Sony has had to reverse its marketing strategy to target younger gamers for that system, Dille said. Now, the PSP is having to compete with more fully featured hand-held game systems that can also make calls, send text messages and provide a window to thousands of games and apps. Apple chief Steve Jobs has boasted in news conferences, saying the iPod Touch and iPhone have become the hand-held gaming leaders. The company recently launched a social networking hub called Game Center. However, Dille said Sony has competitors, like Apple's iPhone and Google's Android, beat for the attention of serious gamers. PSP's focus is on long, immersive entertainment, not five-minute battles between meetings. "These are largely time-killers," Dille said of smartphone games. "Gamers aren't satisfied with that." Whether Sony sees Android's gaming marketplace as a competitor or potential partner, Dille declined to comment. Engadget reported that Android could power the rumored PlayStation Phone. A spokeswoman present during a CNN interview with Dille after the onstage chat said, "We have relationships with Google." The PSP can already do more than just gaming, Dille said. It has applications for watching movies, making calls over Skype and limited Web browsing. But many of those functions are limited by whether you have Wi-Fi access. Plus, it's not a phone, so you need to carry multiple gadgets. But that could be a selling point, said Dille. "Consumers like different boxes," he said. Sony's goal for the PlayStation Network -- the online component for gaming and downloading video of which Dille is also the senior vice president -- is to be an entertainment centerpiece and be always accessible. The current PSP doesn't quite fulfill that vision. "I don't think we fully realize that vision with a Wi-Fi device," Dille told CNN. "If it's not connected [to a cell network] then it does sort of limit people."